A compactor was stolen from a construction site in Guelph on Monday afternoon near Willow Road and Applewood Crescent. 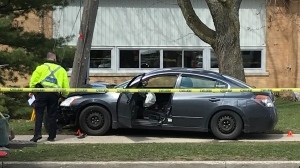 According to Guelph Police, two males riding bicycles were seen leaving the area around 12:00 p.m.
One of the bicycles had a trailer behind it. Allegedly, the males put the compactor in the bicycle trailer before leaving the area.